Elvis Presley once ate a sandwich made with a jar’s worth of blueberry jam, a jar’s worth of peanut butter, and an entire pound of bacon. The novelty item, served at the now-defunct Colorado Mine Company in Denver was known as the “Fool’s Gold.” It cost $49.95 and was served in an entire hollowed-out loaf of bread. The King never forgot the sandwich. On February 1, 1976, he went back for a second round. Rather than recreate the Fool’s Gold at Graceland (his home in Memphis, Tennessee), he took his private jet to Denver and back in one night. The owners of the Colorado Mine Company recall bringing 30 of the gargantuan loaves directly to the plane. Elvis and his comrades ate and drank from the comfort of the Combs hangar at Stapleton International Airport, which has since closed. 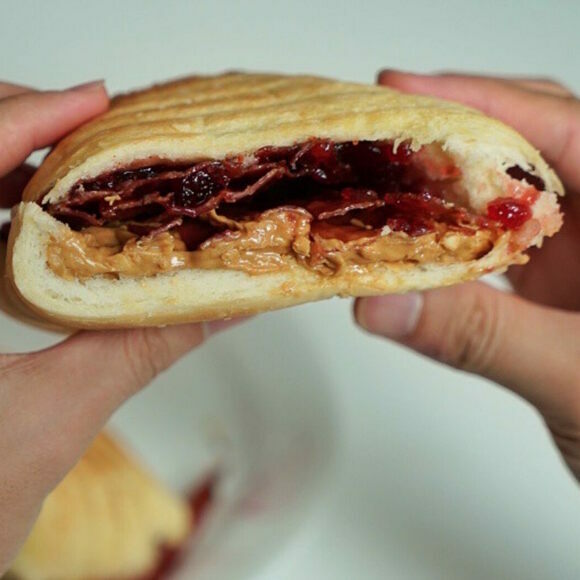 Many Americans still associate the combination of peanut butter, bacon, and a fruity condiment with The King. Restaurants name sandwiches, burgers, and shakes “The Elvis,” but often use sliced banana or grape jelly in place of blueberry jam. In another diversion from the original, most of these tributes are served in modest portions. And while the Fool’s Gold was a single serving for Elvis, it’s estimated that the entire loaf can feed eight to ten people. The chef who made Elvis his first Fool's Gold has been selling a normal-sized rendition of the iconic sandwich from his own establishment for the last 30 years. You can make the loaf-sized version at home, at your own risk. The then-teenaged chef who cooked for The King in the '70s later opened this Elvis memorabilia–accented, cash-only diner in Golden. The Fool's Gold is on the menu.